IFC has announced that it will begin airing Paul Reubens’ cult classic TV show, Pee-wee’s Playhouse, starting this Thanksgiving Day. The network will air a 24-hour marathon, including the iconic holiday special Christmas At Pee-wee’s Playhouse, on Thursday, November 22 starting at 6 a.m. Then, the show will return to its rightful home on Saturday mornings beginning November 24. AHHHHHHHHHHH!!!!! 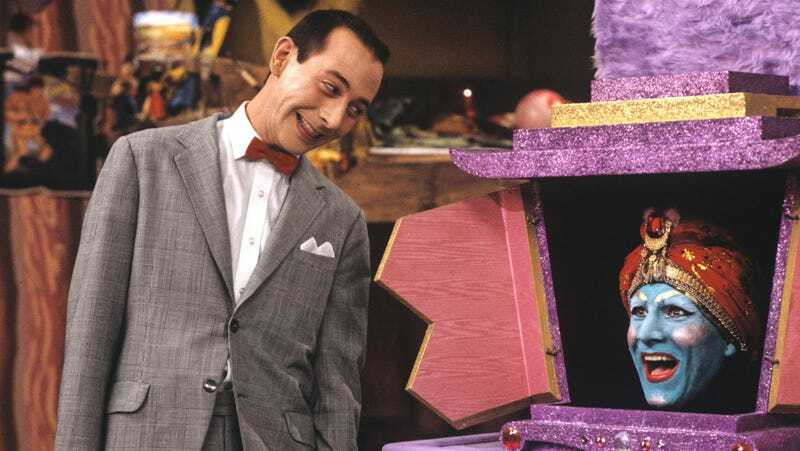 Pee Wee’s Playhouse premiered on CBS in 1986, and was developed from Reubens’ popular stage show and HBO special The Pee-Wee Herman Show, which was similar in style but was made for grown-ups, on purpose. TV Guide named Pee-Wee’s Playhouse “one of the top 10 cult television classics of all time,” and over the course of its original five-year run on television, Pee-Wee’s Playhouse garnered 22 Emmys, Parent’s Choice Awards, and TV Critics Awards. The original series features beloved regulars whose characters were stepping stones for long careers, like Cowboy Curtis (Laurence Fishburne), Reba the Mail Lady (S. Epatha Merkerson), Miss Yvonne (Lynne Marie Stewart), and Captain Carl (Phil Hartman). Its many catchy jingles are probably playing in your head right now, as you figure out a way to ditch your family to spend a few hours at the playhouse, hoping for a glimpse of His Majesty, the King of Cartoons, come Thanksgiving. Last we saw Pee Wee on the screen, he was starring in the Netflix original movie Pee-Wee’s Big Holiday, which saw Reubens’ character going on a big adventure (just not the one you’re thinking of).